If you watch The Office, then you know Rainn Wilson as Dwight Schrute. But a year or so ago, I began to hear about this spirituality project that Rainn Wilson started up, called “SoulPancake.” And then a few months ago, someone on Facebook said that if you didn’t have his book, SoulPancake: Chew on Life’s Big Questions, and you were a youth or college pastor…well, you needed to get it and you probably weren’t doing your job right (I added that part). Seriously though – this is a great book of discussion-starters, ideas to try out with your youth or college groups. I just got it a couple months ago, and we’ve already used it a couple times at our College Coffee Hour at Starbucks after church, and I can see it working out really well for youth group, and for a night of Theology Pub as well, where you might just pass the book around, have someone pick out a question and then have discussions on multiple topics for one night. 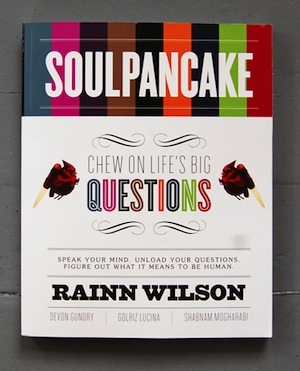 It’s only $12 on Amazon, so if you’re looking for a great resource for your ministry, I’d encourage you to pick up a copy of Rainn Wilson’s SoulPancake book. He also has a really great YouTube channel that’s filled with videos you could also use as discussion starters and some really fun “Metaphysical Milkshake” interviews with other celebrities that are worth checking out. I wanted to use their Valentine’s video from last year for our Pentecost worship service last year, but couldn’t figure a way to do it. I love these. Thanks for sharing. What video is that? You have a link?